It’s not that green and I aren’t on speaking terms, it’s simply a case of mixing in different circles, our paths seldom crossing. That was until today. Today I’m into Wild Wasabi, even buying some Wasabi Peas to assist my process! 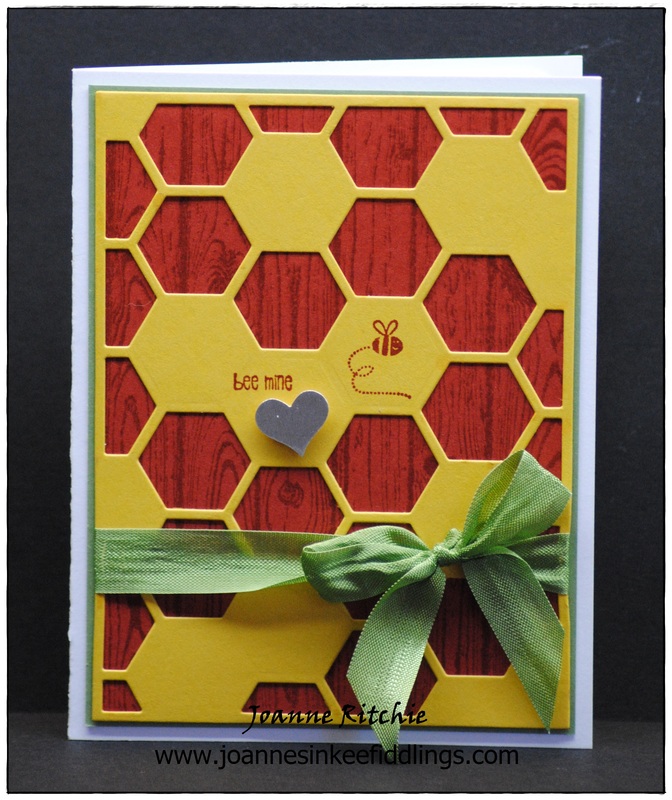 I’ve used Wild Wasabi Cardstock as a thin border behind the Hexagon Hive Die-Cut and Wild Wasabi 1/2″ Seam Binding Ribbon. 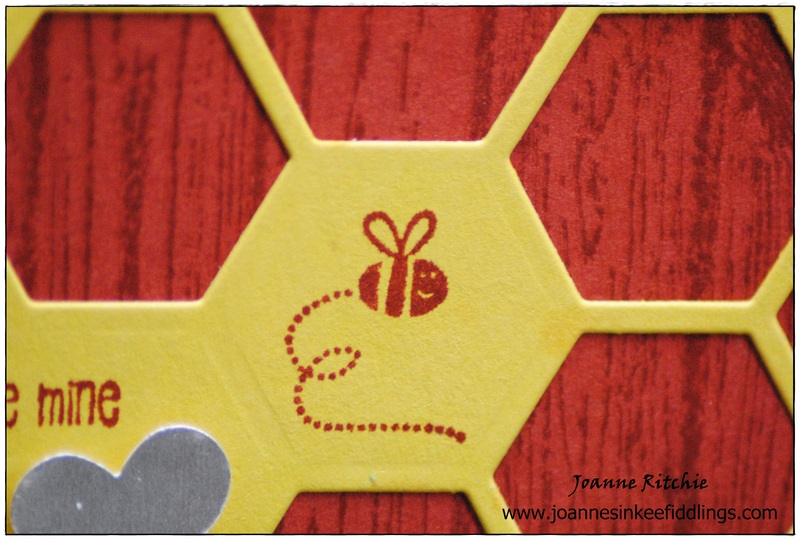 The Honeycomb Hello Stamp Set only JUST arrived yesterday so I was itching to use it with the Hexagon Die-Cut. 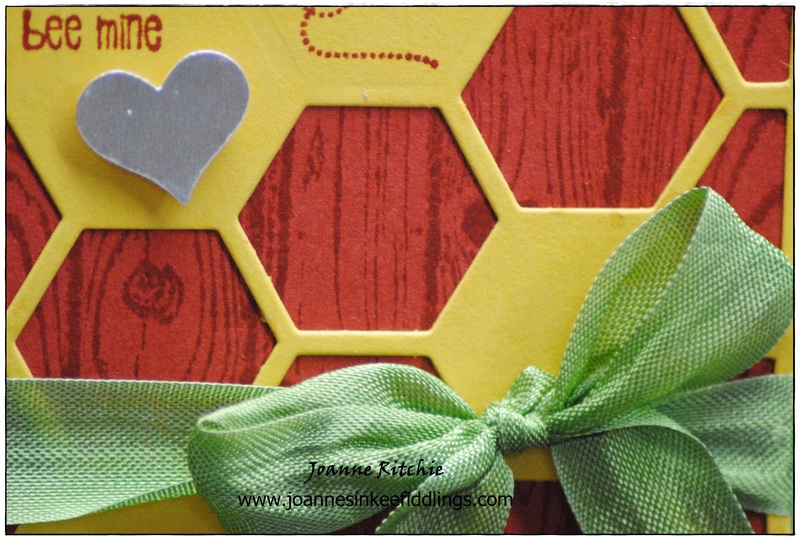 How cute is this bee and the matching sentiment? There is also a heart stamp that coordinates with the Heart Punch in the Itty Bitty Accents Punch Pack but I opted for a simple Silver Foil punched heart. 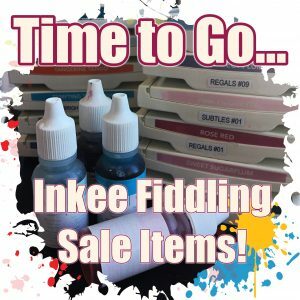 Scrapbooking – my love/hate relationship! Scrapbooking for me is MY prompter of what has happened in our lives. Be it a holiday or simply the everyday things, for me its a physical memory of what has occurred. My problem is I want to remember everything and sometimes I think because of this I often think I’m remembering only a little as I’m on memory-overload. Instant recall isn’t my strong suit but with my scrapbooks it’s there instantly. Well, once it’s completed at least, and therein lies my problem. Last week-end I finally began sifting through one of my MANY bags of keepsakes to begin the arduous task of scrapbooking our 2012 cruise. Unfortunately for me my process is that everything MUST be completed in chronological order and I mean MUST BE. I do so envy those who can scrap what they want when they like. For me, this is not, and will NEVER be the case. Hence it took an entire week to complete just the front page alone as I wanted to work on other parts of the cruise but no, I HAD to begin at the beginning. Aaahhh… it is SO frustrating but once this was completed my process is now slowly beginning to gain momentum. SLOWLY. Here is my page… And yes, I have scanned and printed off in minute-form our tickets from the flights over there but no, I didn’t copy our passports. 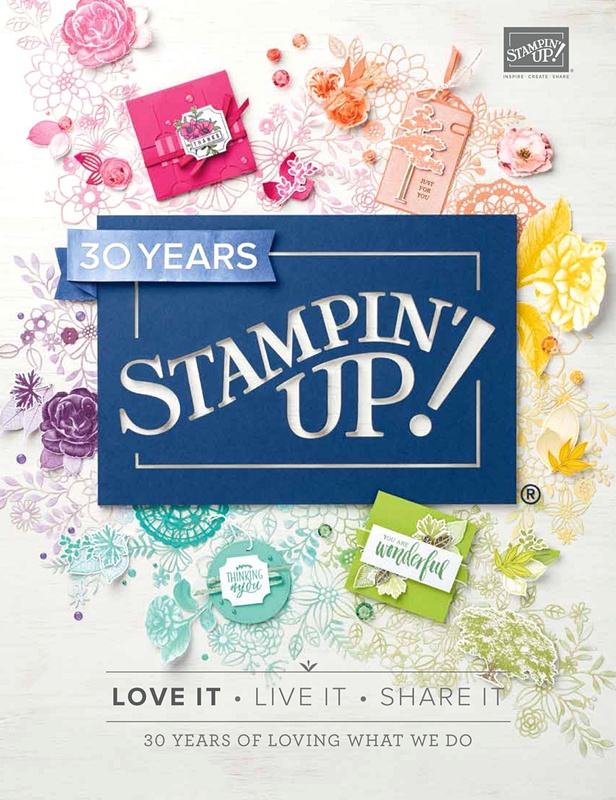 Admittedly I have done so in the past but thankfully Stampin’ Up! 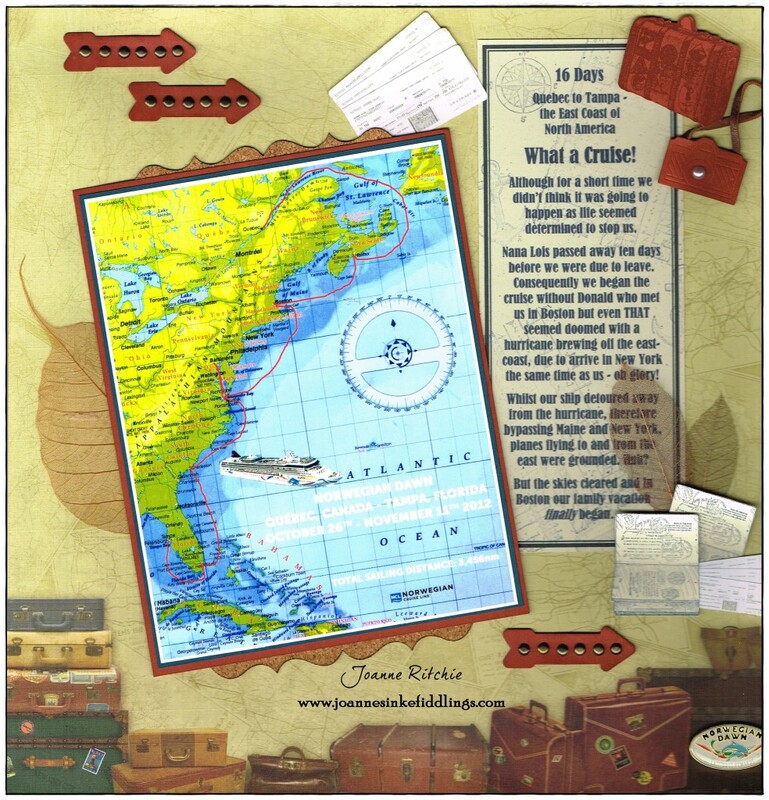 have this issued solved now with their Traveler Stamp Set! So, one front page down, FIFTEEN double pages to go. No guessing what I’m doing this summer, lol 🙂 , but first I need pack for my anniversary week-end away before I resume the torment that is SCRAPBOOKING. Yea me! 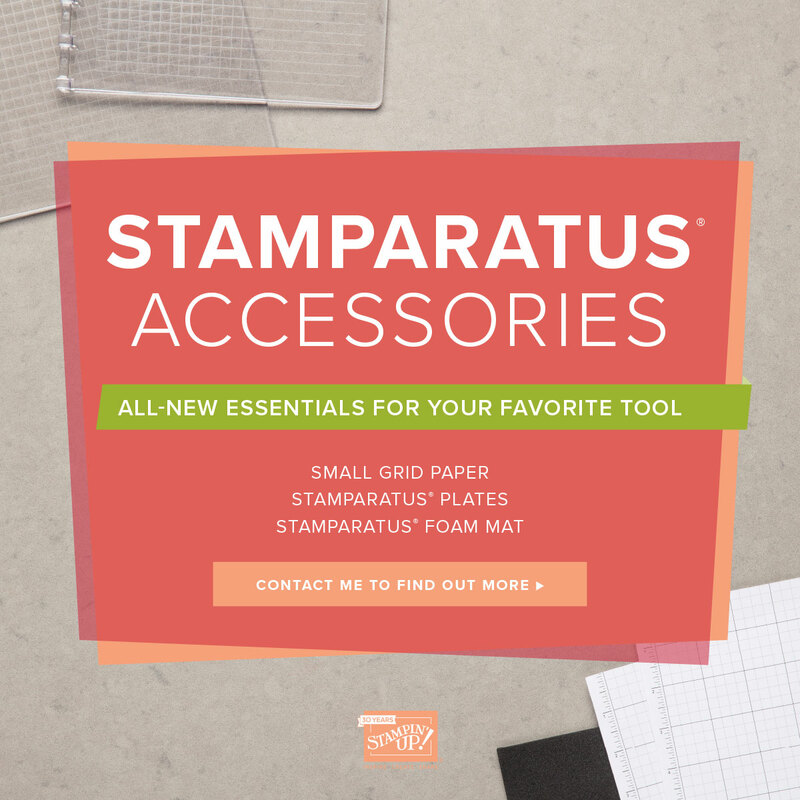 The Hardwood Background Stamp, available in the Celebrate the Everyday catalog, has proved itself quite a main-stay for me these past few months. Depending on the color you choose to stamp with, it can be a subtle or in-your-face background, or it can make quite the feature. 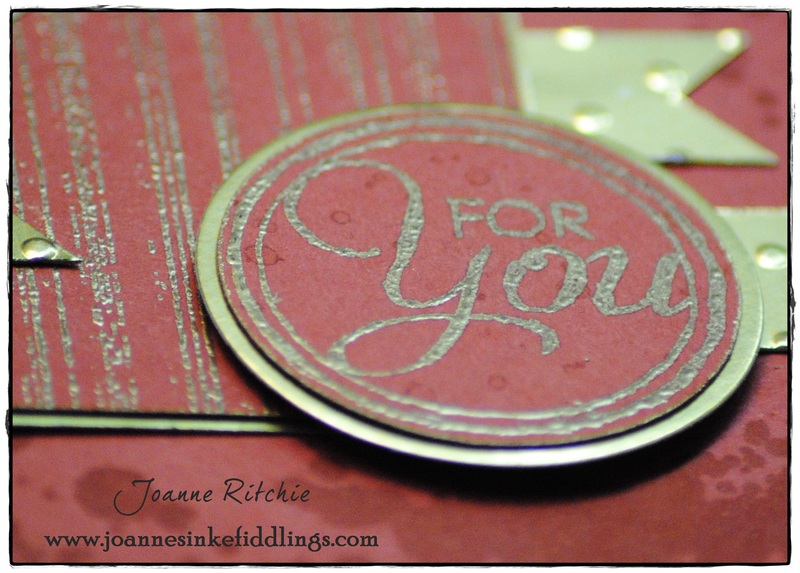 I love this versatility from a background stamp! This first card was quite the mistake and highlights yet another reason why one should really only have ONE stamp pad open at a time when stamping as I intended to be stamping with Crumb Cake Classic Ink not the Cajun Craze Classic Ink, lol! Oddly it made the next step so much easier as I had NO idea what I was going to do next. 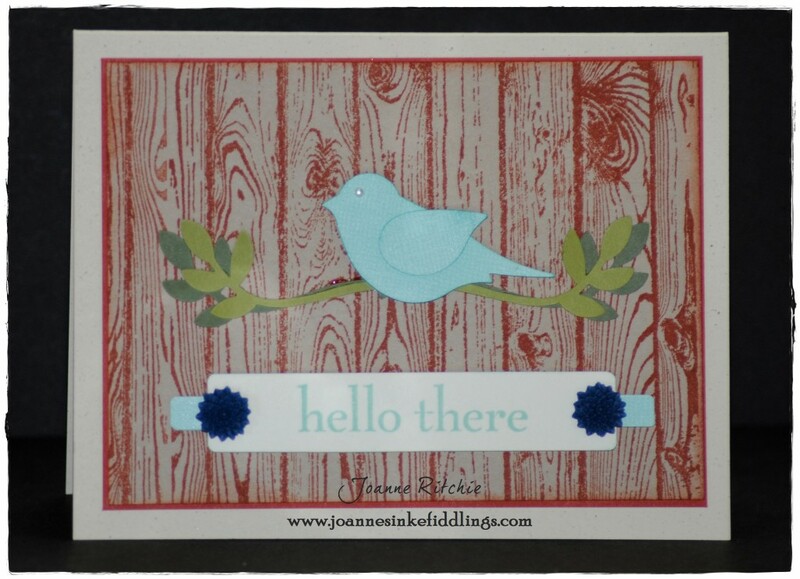 This next card is VERY different to what I’d normally do but when I first added this stamp to my stash, this was the only way I could see how to use it. How funny is THAT! The subtle stamping of this image is what I like best about it, lending itself to more masculine cards I feel, but that could be just me. Even with bling it’s still a male card, lol! 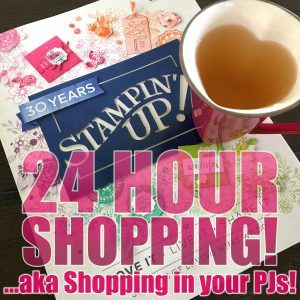 If you don’t have this stamp already and would like to add it to your stash, click on the Shop Now button below which will take you to my 24-hour shopping area. Sign in or create an account if you haven’t already, and begin shopping! On seeing this week’s Mojo Monday sketch, I knew there would be no hesitation on this one as I wanted to use Cajun Craze Cardstock as the background. 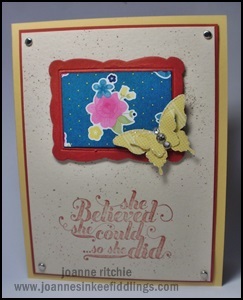 To this was stamped Gorgeous Grunge Stamp Set in Cajun Craze Classic Ink which I used to also sponge the edges. 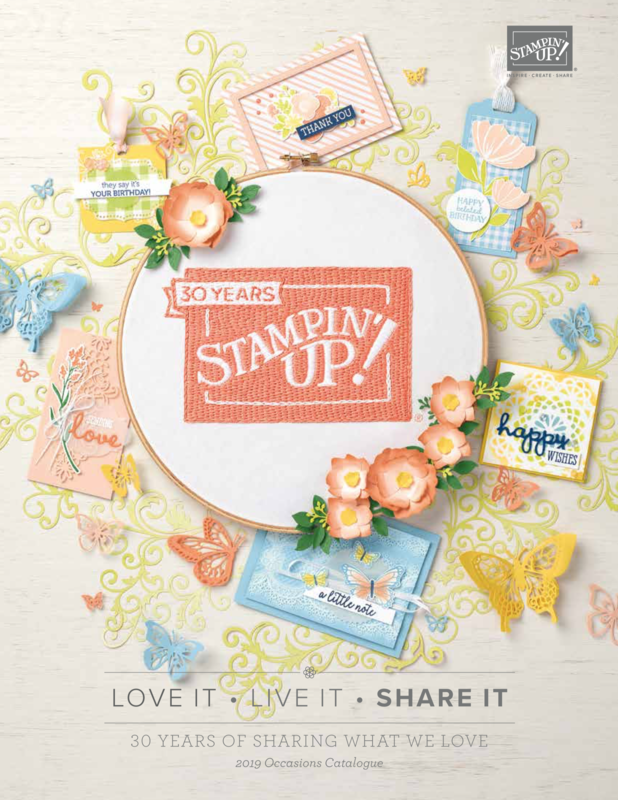 When this color was first introduced to Stampin’ Up! I couldn’t get enough of it but hadn’t touched it again until today. Today I used it as not only the background for my card but for the shapes/accents as well! 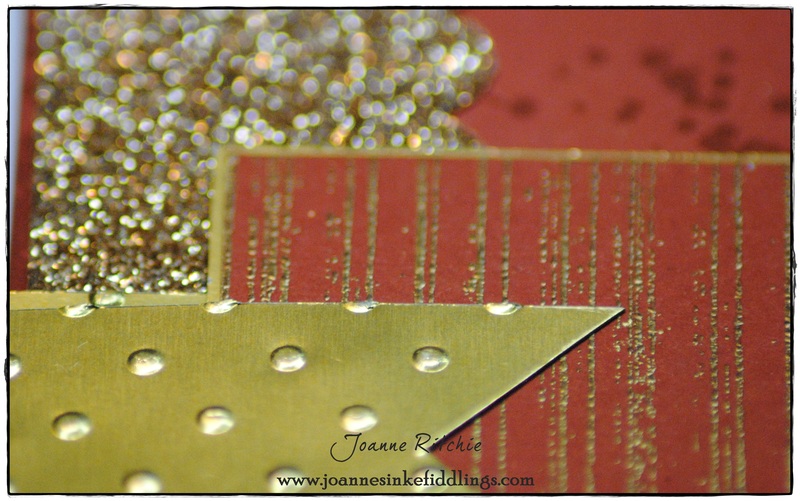 Matching colors with Cajun Craze Cardstock can sometimes be interesting but as you can see on this occasion I simply went with Champagne Glimmer Paper and Gold Foil which was run through the Dots Embossing Folder. The Gold Foil I also sponged with Gold Encore Ink. 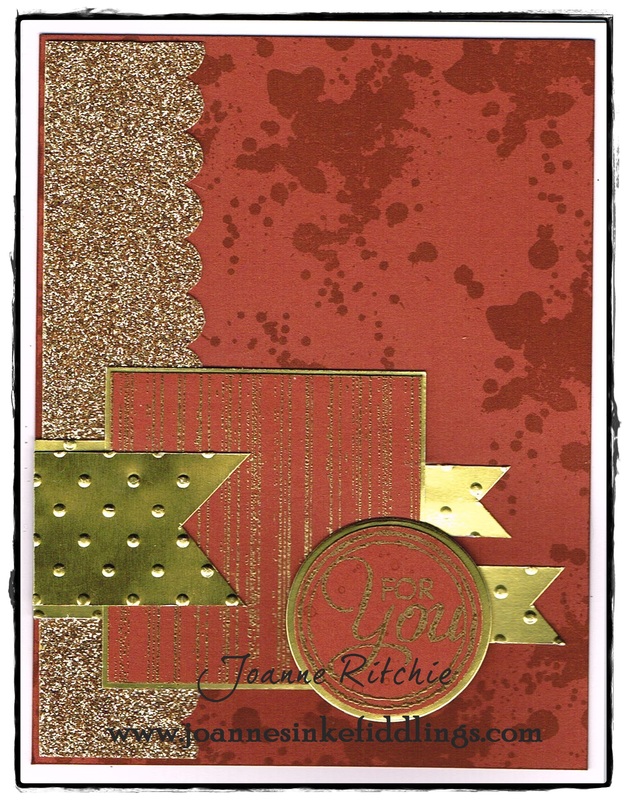 The shapes/accents were Heat Embossed with Gold Embossing Powder – the square I stamped with Versamark the Gorgeous Grunge Stamp Set, the circle stamped with the Chalk Talk Stamp Set. The Gold Foil circle was cut with a Circle Framelit as I wanted only a HINT of a border, not a lot of gold. She Believed She could… so she did! This is one of those cards that looks like you’ve gone to a lot more effort than you really have. Another thing, I’m not really a yellow person, yellow is never my first choice of color, yet here I’ve used So Saffron twice in the one week! On a So Saffron Base I’ve added Cajun Craze to border the Natural Ivory which I’ve spritzed with the Cajun Craze and Chocolate Chip then added Mini Silver Brads to each corner. The sentiment from Feel Goods stamp set was stamped in Cajun Craze. 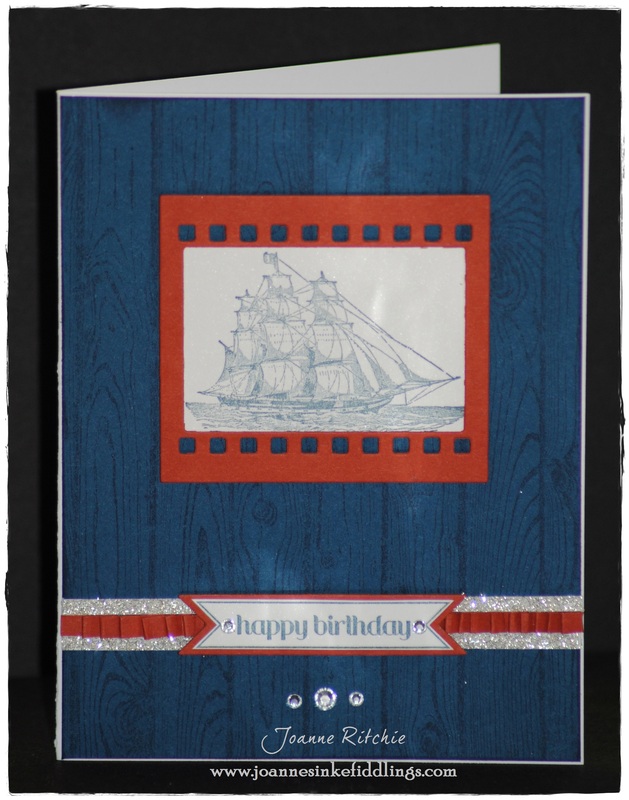 Then in Cajun Craze the rectangular Designer Framed was embossed then fussy-cut out. To the center of this frame I simply added a piece of the Gingham Garden DSP and from the reverse side of that same paper, I punched two different sized butterflies, layering one upon the other. 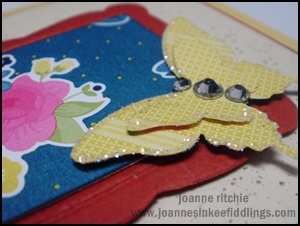 Adding some bling to the butterflies with Rhinestone Jewels and a hint of Dazzling Diamonds (I couldn’t resist! ).